And the media watched it all unfold, relaying the scene moments later to millions of cable news viewers. Nothing will be the same — not the immigration issue, and not the 45th presidency. Some of Trump’s conservative supporters found the spectacle alarming. 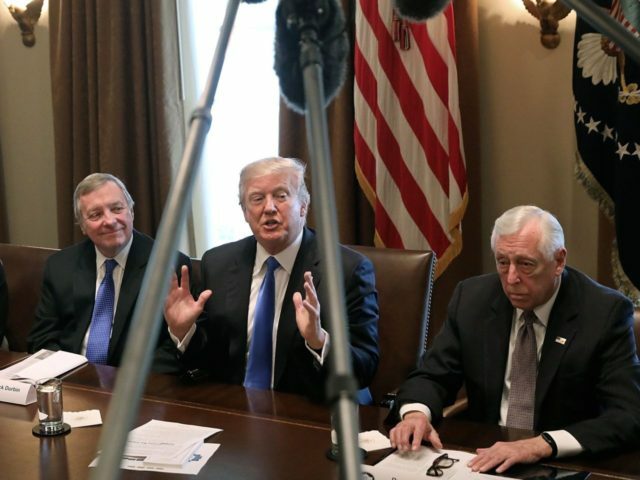 Indeed, it became clear that while Trump insisted on a border wall, an end to chain migration, the cancellation of the diversity visa lottery, and merit-based immigration, he — and the conservatives in the room — had accepted, in principle, legalizing DACA. But for Democrats, the spectacle of their party’s leaders sitting next to President Trump, “normalizing” him, must have been even more jarring. The meeting will likely put an end to serious speculation about the president’s mental capacity; it will also undermine calls for impeachment, which are fueling Democrats’ nascent 2018 midterm efforts. The most provocative president in recent memory led the most civilized political discussion in at least a generation. The DACA meeting could mark the start of a “pivot” for Trump, one that starts with a compromise on DACA and continues through bipartisan solutions on health insurance and infrastructure. That shift could become a runaway “Schwarzenegger 2.0,” a lurch toward liberalism that costs Trump his political base. But it could also mean that the debate shifts towards Trump. As he pointed out, even Democrats are starting to admit chain migration has to go. Trump sold himself on the campaign trail as a dealmaker. He has had few opportunities to demonstrate that skill, other than a short-term funding bill that was agreed behind closed doors last fall. Democrats have refused to deal with Trump in any meaningful way, even when doing so would be in their own self-interest. So he created, at least, the spectacle of compromise. He forced them to talk to him in front of the cameras. There may be no going back.